Biggers Mazda has decades of experience providing a fast and affordable Mazda oil change to Elgin drivers. And to top it off, we not only provide effective and affordable service, but we’ll also double check your vehicle’s vital components to ensure your car isn’t having any problems. Turn left onto Villa Ct.
We’ll be on your left. 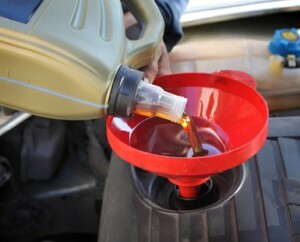 Oil changes help your engine run more smoothly. Dirty oil is not as efficient at cooling your engine and is nearly useless as a lubricant for your small-moving engine parts. Poorly lubricated engine parts will break down much more quickly than parts with high quality, freshly changed oil. Poor lubrication will also create friction between those parts, which will generate excessive heat in your engine block and could result in catastrophic engine failure. We recommend you change your oil every 3,000 to 5,000 miles. And if before then you notice that your oil is dark rather than honey-toned, we recommend you change it now. Biggers Mazda offers a wide range of service specials that include deals on oil changes. Some of our most popular oil specials include a “buy one, get three oil changes free” deal, as well as deals on particular brands of oils and filters. Our specials change regularly, so make sure to check our online list of service specials regularly to avoid missing the oil change special that suits your needs. To schedule for an affordable and efficient Mazda oil change in Elgin, simply Biggers Mazda at (888) 638-7855 or fill out our online service appointment form. You’ll need to include your name, your vehicle make and model, and the days and times you can show up. Otherwise, stop by our shop at 1320 E. Chicago Street in Elgin. We forward to earning your business.